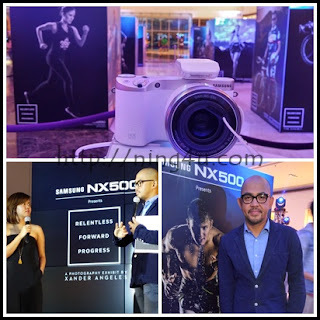 SAMSUNG NX 500 presents the Relentless, Forward, Progress photo exhibit by the renowned photographer Xander Angeles. The photo exhibit aims to showcase almost 40 individuals who athletes, celebrities and personalities that relentlessly pursuing their passion, moving forward in doing what they love and progressing to realize their dreams. The SAMSUNG NX 500 Relentless, Forward, Progress photo exhibit was launched and situated at The Atrium of SM Aura Premier in Taguig City. The said launch was attended by notable personalities like Benjamin Alves, Valeen Montenegro, Drew Arellano, Bianca King and more. The photo exhibit was inspired by Xander's personal and professional evolution as a photographer and artist. His journey involved some lifestyle change that led him to become more conscious about his health and wellness. He found Samsung NX500, a light and compact yet powerful camera as his partner in reaching his goal to inspire others in finding ultimate satisfaction and dedication to push themselves to their physical limits. "I live a healthy lifestyle now and actually lose almost 60 lbs within a year, in the morning I run and I have two shoots in a day hindi na din ako nagpupuyat. I shoot people that inspires me a lot like Matteo and all here." Xander said. "In this exhibit the easier to shoot are the pro but the more exciting are the non-pro, the athletes, I like to shoot them on action and with the help of Samsung NX500 it is more easier and exciting." 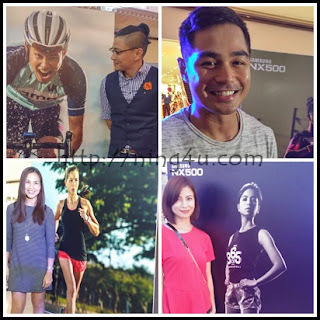 For both Samsung and Xander Angeles, life's many adventures are definitely worth celebrating.